Although we usually tell the children we are “counting their teeth,” the examination is an integral part of the visit. We actually are counting the teeth, to see if there are too many or if there are missing teeth. We are also looking for any growths on the gums, cheeks, palate and tonsils. Checking for cavities involves looking and feeling, using the “counter” to feel if there are any cavities. If there is possible decay, we may ask for x-rays to confirm the diagnosis. Although we use digital x-rays, which use relatively little radiation, we do not take x-rays unless there is a particular diagnostic need. Depending on the age of your child when we find a cavity, we may or may not recommend a filling. The baby teeth perform many functions. Sure, they may look beautiful, but the most important role of the baby teeth is to hold the space needed for the developing permanent teeth, which are developing in the bone underneath the baby teeth. In many cases, if your child loses the baby teeth too early, that may create a crowding situation that may or may not be able to be corrected with braces at a later time. There are different stages of dental eruption that may require fillings in certain teeth. Knowing when teeth generally fall out enables me to make a better recommendation as to whether you would have me fill the cavities or not. Sometimes we fill the teeth to prevent the cavities from spreading to the next tooth. If your child gets a cavity, we will discuss all treatment options with you. The American Academy of Pediatrics, the American Dental Association and the American Academy of Pediatric Dentistry recommend the first dental check-up at 12 months of age. Children have a total of 20 baby (primary) teeth. Some baby teeth can remain in the mouth until age 13 or longer. Baby teeth need to be cleaned regularly starting as soon as teeth enter the mouth. 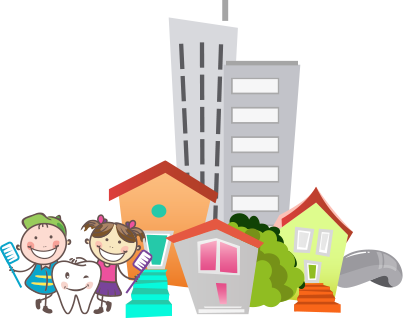 More than 40% of children have tooth decay by age 5.